← How to secure an RDP connection without VPN? ISL Online’s tunnelling technology is a powerful feature which, besides giving you the possibility to establish a secure RDP connection to a Windows computer in a remote network, also provides you with a few other advantages. You can create a jump box to a remote system or allow local users to access a remote computer through your own computer. 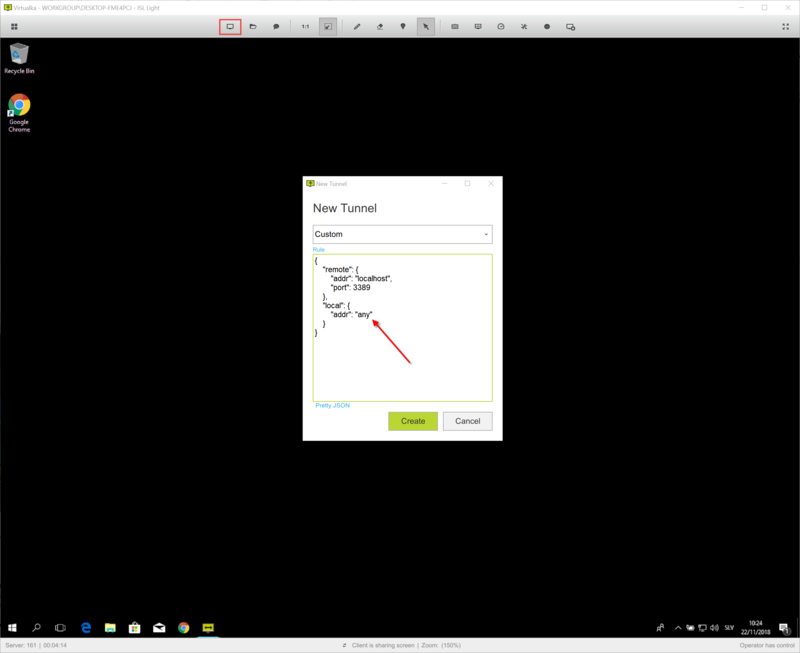 In our previous post, we have covered detailed instructions on how to configure the tunnel and then start an RDP connection via ISL Online (read the blog). Once you have done that you can try out the advanced use cases we present below. In this scenario, you install the ISL AlwaysOn remote agent on only one computer in the remote network. This computer serves as a jump box through which you can then connect to any other computer in the same remote network. First, you need to install ISL AlwaysOn, the remote agent, on a Windows computer in the remote network. This machine will serve you as a jump box. Once you have set up unattended access, connect to this computer. 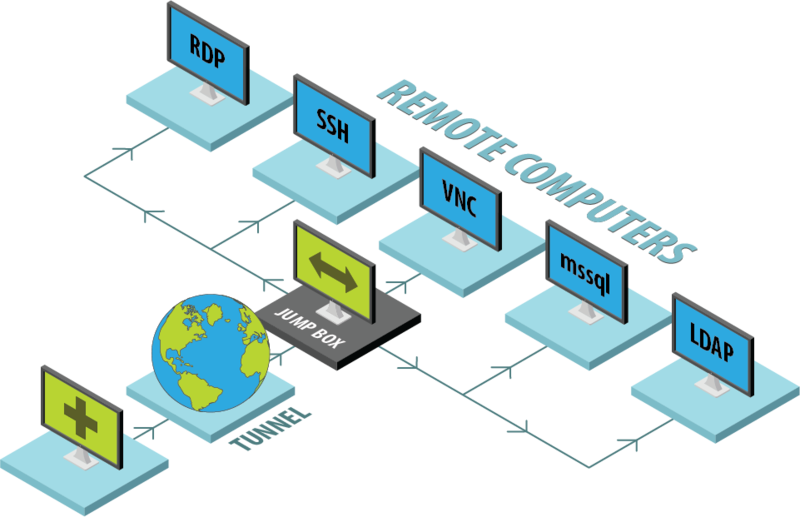 From there you can reach any other RDP enabled computer in that remote network. What you’ll need to know is the IP addresses of those computers. Click the “Desktop Sharing” icon on the ISL Light remote view and select “New tunnel” under “Connect via” option. Choose RDP tunnel and type in the IP address of the computer which you’d like to access. In the dialog window you can see the rule, which will automatically execute the RDP program and connect to the IP you have specified through the ports specified in the rule. Once you have created a new tunnel (you have actually defined the rule) it shows up in the menu of your local computer under “Connect via”. So, next time you will be able to connect directly to that specific computer in the remote network through a jump box by skipping the first step of connecting to the jump box computer with the ISL AlwaysOn remote agent installed. Open ISL Light and go to “Computers” tab. Click the hamburger menu right to the jump box computer. Click “Connect via” and select the desired computer in the remote network by identifying its IP number. In this case, you establish an RDP connection to a computer in a remote network with the ISL AlwaysOn remote agent installed. By creating a custom tunnel, you can then allow users in your network to connect to the remote computer through your computer by using their RDP access. This time your computer plays the role of a jump box. First, you need to install a remote agent, ISL AlwaysOn, on a computer in the remote network. This is the computer to which you would like to allow access to other users in your network through RDP. 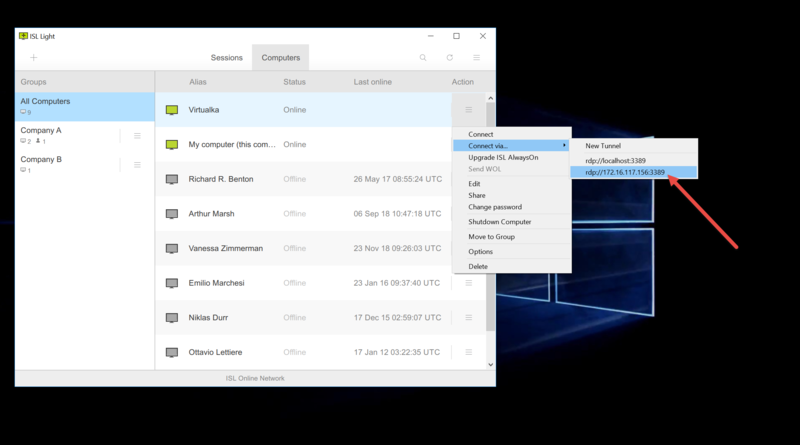 Connect to the AlwaysOn enabled computer in the remote network and create a new custom tunnel (Desktop Sharing icon > Connect via > New Tunnel). In the rule, you need to specify that on the local part you will bind all the IPs available so anyone can connect through your computer. This gives users in your network the possibility to connect to the remote computer that only you have on your list of remote computers. 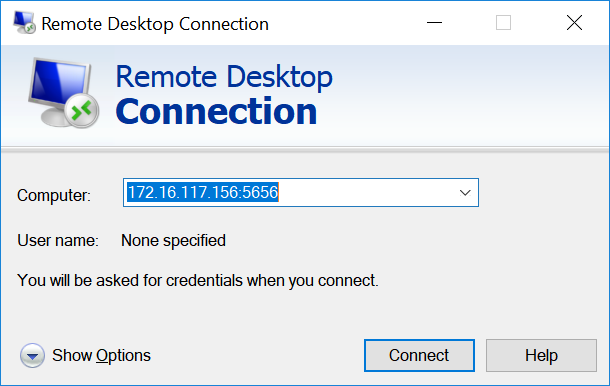 Any user in your local network can now connect to the remote computer through your computer and control that remote desktop via RDP. They need to know the IP address of your computer and the port through which the connection is established. You can specify the exact port in the rule when you create a new custom tunnel or you can just leave it empty like we did above and go for a random port. You can find the port number on the local side by clicking “Connect via”. You can see the port number under “Connect via”. Search for the tunnel to the target computer and look for the port on the local side. The user opens up the Remote Desktop Connection on their computer, types in the IP address of your computer (jump box in this case) and the local port and clicks connect. Once they insert the Windows credentials of the target computer, they are connected to the remote computer via an RDP connection. These are the two advanced options ISL Online tunnelling technology offers. Users who are familiar with tunnelling can create a tunnel and specify how the traffic will be tunnelled to the remote computer. 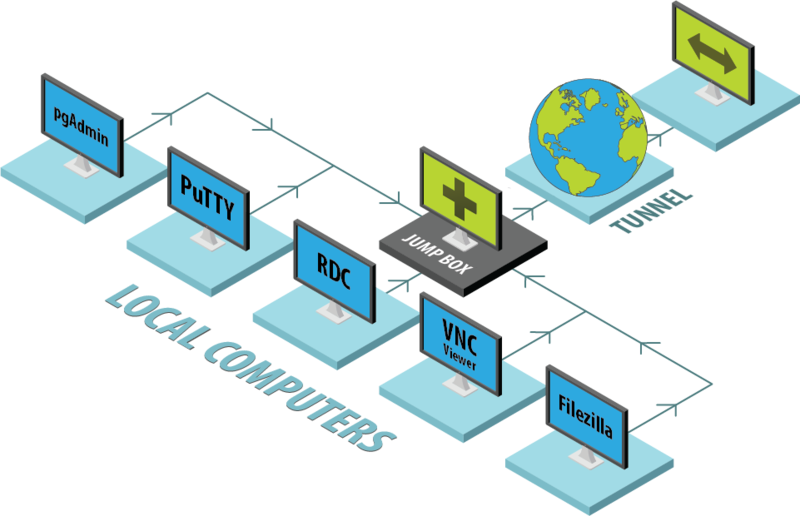 This enables remote service accessibility even though it was originally configured to be only accessible on local computer or network. You are welcome to read detailed screenshot instructions about tunnelling possibilities on our help pages or check our website for more information. 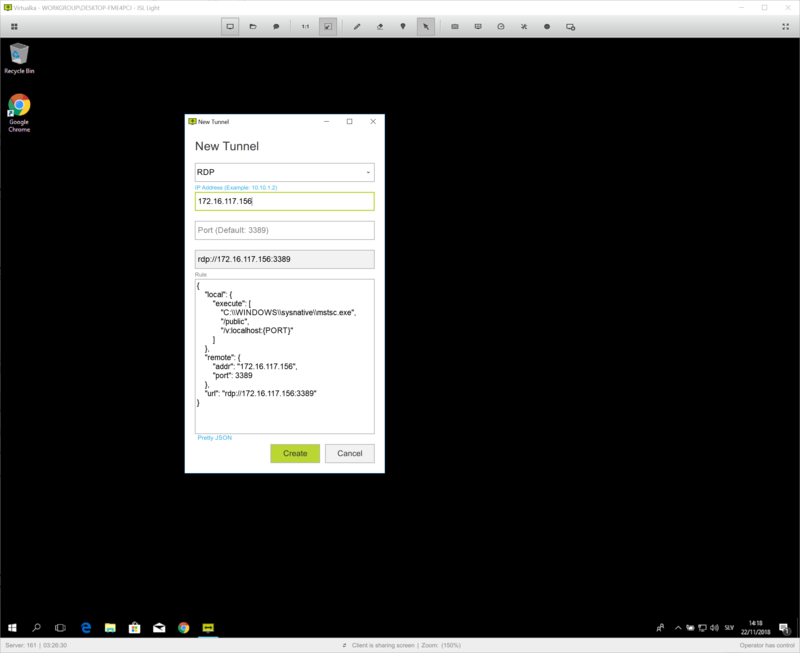 This entry was posted in RDP, Tunnelling and tagged ISL AlwaysOn, ISL Light 4, jump box, RDP, remote access, remote desktop, route rdp, tunneling, tunnelling technology, tunnels, unattended remote access. Bookmark the permalink.